The restaurant trade has never been more competitive. What can restaurants do to maximise their profitability, and win a greater share of the market than competitors? We explore five key steps to develop your business, regardless of size. Are your wait staff still writing checks, relying on old-fashioned carbon duplicates? What does it result in? Wasted time standing at the table scribbling things down. Checks that don’t make it to the kitchen, left languishing on the waiter’s pad. Indecipherable special requests that go out wrong from the kitchen and get sent back again and again. Why leave such a fundamental part of the process so unregulated? There are some amazing handheld, automated systems that streamline the whole process, improving accuracy, efficiency and speed. We refer to a system, a combination of hardware and software, that connects the cash register with handheld devices to manage the whole process from order till payment. Restaurants need nowadays to conform to customers’ expectations like speed and efficiency. Therefore it is vital that a strategy handling consumptions is well thought through. Timing is crucial, starting from placing the order, communicating it to the kitchen and the bar, up to bringing both food and drinks to the table. The right timing which implies meeting customers’ requests in time and with no mistakes, will create a positive experience that customers will eventually share with their communities. Knowledge is power, and that’s as true in the restaurant trade as anywhere else. You think you know your business? Think you’re clear on who your customers are, when they’re visiting, what they’re ordering? You may have a pretty good feel for it, but it’s amazing what a difference metrics could make. The more data you have, the more accurately you can make predictions for the future; stock levels, staffing levels, the specific temperature that triggers people’s desire to dine ‘al fresco’, the beer that sells best when a big match is on – there are endless things you can find out when you have the right data at your fingertips. The benefit of using an integrated and automated system such as the ATOS 15 M combined with the ‘Back Office’ plug-in is that every order is logged, so that data can be analysed in a meaningful way. RCH also offers a number of plugins that make your data management even more complete; for instance ‘Fidelity’, improving your relationship with customers, increasing loyalty and maximising profitability, whilst ‘reservations manager’ makes sure you’ll never double book a table again. All of this with the highest levels of data security. And with ‘multiple checkout’ functionality added to the ATOS system, the whole process is scalable from the smallest Italian trattoria to the largest chain of fast-food chicken outlets. Ultimately, a clever deployment of technology can take 50% of the stress out of restaurant management, whilst increasing profitability and efficiency by the same amount. It’s win-win. Attentive service at the end of the meal is just as important. And it’s surprising how culture massively impacts how the meal is concluded – especially in relation to payment. Countries such as Sweden and the Netherlands are now increasingly seeing bars, restaurants and shops that are ‘card only’, whilst countries such as Italy or Thailand are still ‘quaint’ enough to be strictly cash-only places. Some countries you expect the bill to be brought to your table, and conclude the payment process there, whereas in some countries you’d expect to go up to a desk after your dinner to conclude the payment. Then there’s the issue of tipping. If it’s a country where tipping is customary, then customers are often in a quandary about whether they can add it on the card, whether it will really go to the server, should they just pop cash on the table? Try to think of ways to make this process as easy and stress free for your diners – even if it’s just a discreet message placed at the end of the menu or receipt. Aim to use technology to make post-meal payment as straightforward and intuitive as possible. Specials are also a key part of the menu. Customers crave variety – if you don’t offer a new reason to visit, customers will simply find a new place to visit. They want a consistency of quality, but excitement in the experience. But specials also offer an excellent way to maximise the value of leftover stock and minimise wastage, so long as you have clever and innovative chefs able to craft something interesting from the bottom of the fridge! Communication is the beating heart of a restaurant – how your front of house communicates with the kitchen or with each other, how managers communicate – it’s all fundamental to how smoothly the operation runs, and the systems identified about are key in facilitating that internal communication. But external communication is also a key element. Referring back to the point above about running specials – what good are these if your customer base doesn’t know about them? Signage facing into the street with changing daily specials doesn’t just lure in walk-ins, but it builds the perception of your brand on a daily basis – therefore capturing not only impulse diners, but intentionalist diners who gain more and more motivation to visit every time they pass. Unfortunately, lots of restaurants don’t capitalise on this marketing potential and just have servers explain the specials to customers. Do you want to know a secret though? Customers hate this. They feel flustered listening, and they want to linger over descriptions as they weigh them up. But printed daily papers are tacky, and chalkboards can be messy and cluttered, so what’s the best option? Integrated LCD screens are increasingly showing promise as an option – and far from being tacky or brash, they are now being manufactured in a way that discretely and elegantly blends in with more traditional restaurant surroundings, with both streamlined and more elegant frame surrounds, and even matte-appearance finishes on the screen that give a convincing impression of a chalk-board or painting. Whatever solution you do find – make sure to keep your external communications fresh, up-to-date and relevant, so that you are constantly giving the customer something to come back for. RCH is committed to helping its clients maximise their potential in the food and beverage market, and has worked hard to provide dynamic and innovative solutions that meet the challenges of a competitive and constantly changing industry. 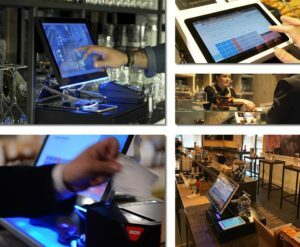 If you want to find out more about the hardware and software options that can enhance your restaurant business, please contact us at http://www.rch.it/contatti/ to find out more.